10Fold began a PR program for PrecisionHawk, a commercial drone and data company, in April of this year. While PrecisionHawk had chosen 10Fold to increase its visibility in the business media, there was little time for initial strategy as PrecisionHawk’s immediate priority was to announce its Pathfinder Report. Created in collaboration with the FAA, the report outlines safety standards regarding drone operations and would be released at a major trade show in three weeks. 10Fold was charged with securing CEO briefings and coverage. The 10Fold team was able to secure 14 briefings for the CEO prior to the show with nearly 40 articles resulting from its media relations efforts, including a piece in Forbes. Following the show, 10Fold worked closely with PrecisionHawk’s executive team to create compelling narratives for the business media. Within the first six months, 10Fold was able to increase the amount of business media coverage for the company, securing articles from Reuters (featured on CNBC.com), Wired and Forbes. Below is an analysis of media coverage for PrecisionHawk before and after its engagement with 10Fold. 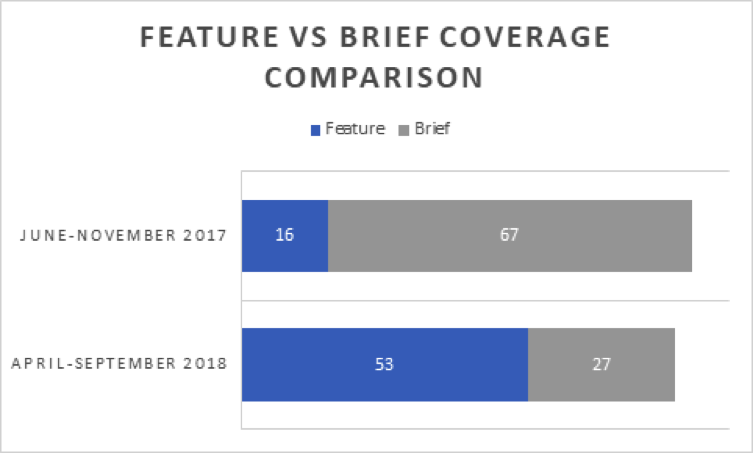 While the overall amount of media coverage remained relatively consistent, the 10Fold team more than tripled the number of features for the company. The quality of media outlets also improved significantly with examples included below.